About 500 species in the genus Potentilla grow in the northern hemisphere. They can be annual, biennial, or perennial herbs or small shrubs, depending on the species. Most garden varieties are a form of Potentilla fruticosa, a small deciduous shrub. Many Potentilla species have leaves divided into five leaflets arranged palmately - that is, like the fingers of a hand. This is the origin of the common name cinquefoil, from French 'cinque feuilles' meaning 'five leaves'. 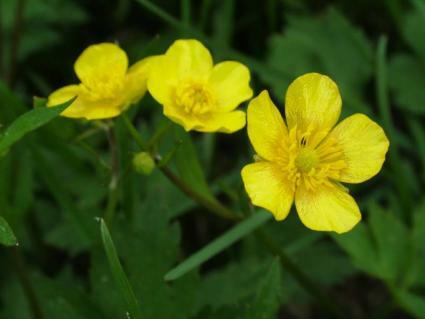 The cheerful yellow flowers look like buttercups, which explains its other common name, buttercup shrub. If you are planning a butterfly garden, Potentilla should be one of your first choices of plants to include. Potentilla species attract butterflies. The flowers are a nectar source. The larvae of some species, such as Pavonia pavonia (Emperor Moth) and Pyrgus malvae (Grizzled Skipper), feed on the leaves. A few Lepidoptera species feed exclusively on potentilla, especially Pyrgus cirsii (Cinquefoil Skipper) and Pyrgus bellieri (Foulquier's Grizzled Skipper). Deer are not fond of potentilla. This plant is frequently used in a border or rock garden and as a ground cover or foundation planting. Larger varieties are sometimes used for a low hedge. It is easy to grow and adaptable to a wide range of sites, and it is attractive all season. The most commonly cultivated species is Potentilla fruticosa. This is an easy shrub to grow. It prefers a loamy soil, but will tolerate sand or clay. It prefers even moisture and good drainage, but can tolerate boggy conditions and, once the shrub is established, will endure drought. Flower production is best in full sunlight, but flower color will last longer if the plant is lightly shaded in the afternoon. Flowers are produced on the tips of new growth. Gently shearing the shrub after the first bloom will produce more new growth and keep the shrub flowering all summer. A light application of fertilizer after shearing is also helpful. 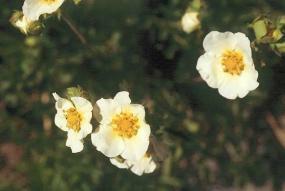 Potentilla can be rejuvenated by pruning the oldest stems back to the ground in late winter. Never remove more than one-third of the shrub. The shrub can be divided in spring. Softwood cuttings can be taken in the summer. Transplanting is easy as long as the soil is evenly moist. Many new varieties of Potentilla fruticosa are being developed. Gardeners can plant potentilla that bloom in a wide variety of colors and have compact forms. Some varieties are double flowered. Potentilla fruticosa is a valuable garden plant. Another potentilla species, Potentilla recta L., commonly called sulphur cinquefoil or roughfruit cinquefoil, should not be planted in North America. It is on the USDA's list of invasive species. White Cinquefoil (Potentilla Alba) - The leaves of this pretty plant from the Alps and Pyrenees are quite silvery, and have a dense silky down on the lower sides. It is very dwarf, and not rampant; its white Strawberry-like flowers nearly 1 inch across, with a dark orange ring at the base. Easily grown in ordinary soil; blooming in early summer. Division. Alpine Cinquefoil (Potentilla Alpestris) - Closely allied to the spring Potentilla, forming tufts nearly 1 foot high, with bright yellow flowers about 1 inch across. Though not common, it is found on rocks and dry banks, in several parts of the country. A more vigorous form of this plant, from the central and southern Pyrenees, is pyrenaica, with larger flowers of a deeper yellow. Potentilla Ambigua - A dwarf compact creeper, large clear yellow blossoms on a dense carpet of foliage in summer; is perfectly hardy, requiring only a good, deep, well-drained soil in an open position in the rock garden. Himalayas. Shrubby Cinquefoil (Potentilla Fruticosa) - A pretty neat bush, 2 to 4 feet high, bearing in summer clusters of showy golden-yellow flowers. It is suited for the rock garden or the dry bank. Its variety humilis is a tiny miniature, of charming effect in the rock garden, and the form davurica (perhaps a hybrid) is quite prostrate. Shining Cinquefoil (Potentilla Nitida) - A beautiful little plant from the Alps, a couple of inches high, its silky silvery leaves seldom with more than three leaflets each. The flowers are pretty and delicate rose. It is well worth a good place in the rock garden, and needs a little more care than other kinds. Potentilla Tonguei - A charming plant for the rock garden, and unlike any other kind in its orange and terra-cotta colored flowers. It is of hybrid origin, and only rises 3 or 4 inches above the soil. Potentilla Tridentata - A spreading carpet-like plant from N. America, rarely rising above 4 inches, its dark evergreen foliage prettily spangled with white flowers in June and July. It does best in a moist, fairly rich place, and will bear partial shade. Easily increased by division. Potentilla Veitchi - Finer in every way than P. fruticosa, P. Fredrichseni, and the few others of fruticose habit, while the flowers are larger and prettier. It grows 3 or 4 feet high, is evergreen, and has handsome sprays of nearly pure white flowers from May onwards.